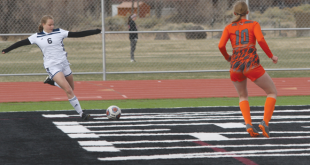 Face Gunnison, in Gunnison, Saturday at 11 a.m.
After dropping their first game of the spring season to Carbondale 2-0, the West Elk Soccer Association (WESA) U18 team rebounded with a hard-fought win over Montrose, edging out a 3-2 win last week. The high school coaches use the spring club season as a chance to test players and experiment with lineups each year. The focus is on development and giving the younger players an opportunity to raise their level of play while shifting the older players into different roles to expand their knowledge of the game. That strategy, matched with a lack of practices on grass, typically results in winless seasons with the focus on progression rather than results. Well, the team got the best of both worlds as the coaches worked players into new positions for stretches at a time and saw some positive things on an individual level and still pulled off the win. There’s no question team positioning was suspect for WESA all game long as Montrose managed to set the pace and press into WESA’s half for most of the game. WESA opened the first half with the younger line up and were immediately pinned in their half. Despite the constant barrage, veteran players Walker Carroll and Will Hoskin were able to help the team hold on as they worked in the back four. WESA’s attack was nearly non-existent for the opening minutes but when they did break up-field, they started to threaten and the difference came eight minutes in as Jovany Aguirre rose up in the 18 to head home a corner kick from Carlos Franco for a 1-0 WESA lead. The goal offered a bit of a reprieve from the Montrose attack while WESA started to match the play of Montrose for the next 20 minutes. WESA goalie Slater Weil came up with a couple of key saves to keep the lead in tact until the 26th minute when Montrose jumped on an errant pass at midfield and capitalized to tie the game 1-1. Two minutes later WESA struck back as Tommy Linehan turned the ball wide to Oliver Houseman as WESA entered the attacking third. Houseman chipped the ball into the penalty box and Dylan Eaton flicked a head ball over the Montrose goalie to put WESA up 2-1. Four minutes after that Montrose responded as a player gained a step 30 yards out and drove a high shot into the upper corner, tying the game 2-2 heading into halftime. The second half played out like much of the first with Montrose applying a majority of the pressure while WESA scrambled to cover their bases defensively. A push by WESA early in the second half provided a penalty kick and Linehan finished for a 3-2 WESA lead. Montrose pressed hard the remainder of the game but Weil was spot-on in net and the back line of Will Hoskin, Walker Carroll, Finn Smith, Owen Berv and Henry Bryndal held tight to hold the lead and WESA emerged with a 3-2 win. 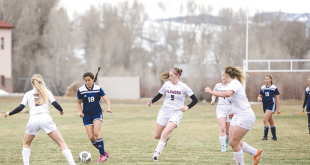 WESA will face Gunnison on Saturday, May 6 at 11 a.m. in Gunnison and then hits the road Sunday for a doubleheader in Montrose.